Fifteen local companies have won contracts as part of the £350m expansion of Aberdeen Harbour. Breakwater construction started in May. The news follows three ‘meet the buyer’ events hosted by the city council on behalf of Dragados, the construction group leading the development. The winning companies have secured contracts for services including the supply of quarry materials, traffic management and safety training. Dragados project director, Jose Enrique Perez, said: “Dragados UK value these events very highly and considers them essential to creating dialogue between ourselves and the local supply chain. All three Meet the Buyer events were very well attended, allowing us to explain the project to the supply chain and in return they made us aware of the goods and services they provide. 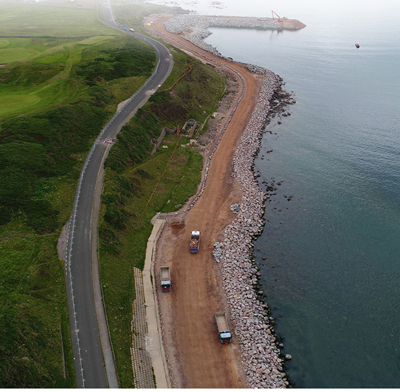 New facilities and associated infrastructure are being developed at Nigg Bay, south of the existing harbour, to accommodate larger vessels. The project will take three years and calls for construction of breakwaters, quays, improved access roads and temporary construction and fabrication areas. Construction of the north breakwater started in May and this month sees the start of dredging works.